No Questions Asked 100% money-back Guarantee! Recommended Use: As a dietary supplement for adults. Take three tablets daily with meal. BoneHealth contains calcium carbonate with cholecalciferol (Vitamin D), magnesium & zinc to help maintain healthy bone formation. 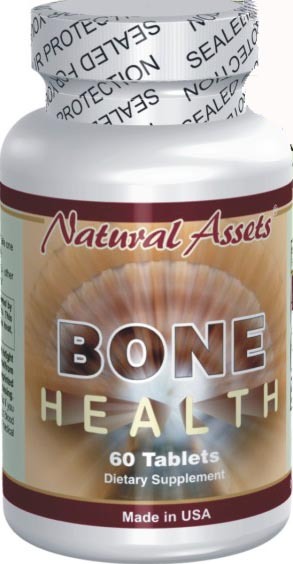 BoneHealth is formulated with purest and potent ingredients. The product is manufactured under FDA registered and approved facilities in the United States. Calcium In a three-year study at Tuft University in Boston, 176 men and 213 women aged 65 and older supplementing with calcium and vitamin D moderately reduced their bone loss in the femoral neck, spine, and total body and reduced the incidence of nonvertebral fractures. Calcium supplementation produce beneficial effects on bone mass throughout post-menopausal life and may reduce fracture rates by as much as 50%. A diet rich in calcium and Vitamin D may lower the risk of developing premenstrual syndrome (PMS), a condition that affects up to a fifth of all women. Previous studies have suggested that calcium supplements and vitamin D, a hormone that regulates the absorption of calcium, may reduce premenstrual occurrence and severity. The researchers compared the diets and supplement use of 1,057 women aged 27 to 44 years old who reported developing PMS over the course of 10 years to 1,968 women who reported no diagnosis of PMS or no or minimal premenstrual symptoms in the same time period. The women, who participated in the Nurses Health Study, all reported no PMS in 1991, at the beginning of the study period. Their intake of calcium and vitamin D from diet and/or supplements was calculated from food frequency and standard NHS questionnaires administered in 1991, 1995 and 1999. The researchers conclude that while previous studies have observed the benefits of calcium supplements for treating PMS, this is the first, to our knowledge, to suggest that calcium and vitamin D may help prevent the initial development of PMS. The researchers' findings, together with those from several small randomized trials that found calcium supplements to be effective in treating PMS, suggest that a high intake of calcium and vitamin D may reduce the risk of PMS. At Dartmouth-Hitchcock Medical Center in Lebanon, New Hampshire, calcium supplements were found to provide a significant reduction in large-bowel adenomas, which are likely precursors of most colorectal cancers. Vitamin D3 Increased vitamin D levels appear to improve muscle strength and physical function for vitamin D-deficient patients with knee osteoarthritis, according to research presented at the American College of Rheumatology annual meeting in San Antonio in November 2004. The researchers said they measured changes in pain, physical function, muscle strength and serum levels of vitamin D twice or more times across a 15-and 30-month period in a group of 221 patients, aged 67 years old on average. Vitamin D, which comes primarily from exposure to sunlight, increases the absorption of calcium and phosphorus in bone mineralization, growth and repair. Sources of vitamin D are available to a lesser extent from dietary sources typically found in fortified margarine, oily fish, liver, fortified breakfast cereals and dairy products. However, the elderly are less efficient at producing vitamin D from sunlight and absorbing it from food. Zinc is essential for skeletal development and has antioxidant effects and functions in the antioxidant enzyme superoxide dismutase (copper-zinc SOD). Zinc levels are typically reduced in patients with rheumatoid arthritis. Some of the studies demonstrated a positive therapeutic effect in the treatment of rheumatoid arthritis. Magnesium is important for maintaining strong bones. The human body contains about 21 to 28 grams of magnesium, 60 percent of which is in the bone. Magnesium supplementation is as important as calcium supplementation in the treatment and prevention of osteoporosis. People with osteoporosis have lower bone magnesium content and other indicators of magnesium deficiency than people without osteoprorosis. Copyright ©2003- healthychoicenatural All Rights Reserved. treat, cure or prevent any desease disease.